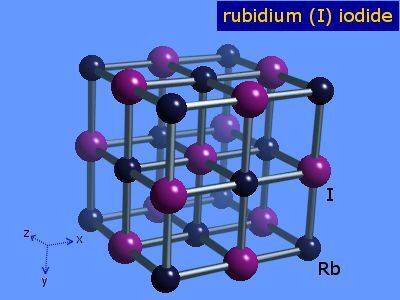 The oxidation number of rubidium in rubidium iodide is 1. One way to make rubidium iodide is to react the hydroxide with hydroiodic acid. The resulting salt can then be purified by recrystallization. Rubidium(I) iodide can also be made by the neutralization of rubidium(I) carbonate with hydroiodic acid. The resulting salt can then be purified by recrystallization. While not a normal route of preparation because of the expense, rubidium metal reacts vigorously with all the halogens to form rubidium halides. So, it burns with iodine, I2, to form rubidium(I) iodide, RbI. The table shows element percentages for RbI (rubidium iodide). The chart below shows the calculated isotope pattern for the formula RbI with the most intense ion set to 100%.